After many failed, comical months spent teaching my dog to obey simple commands, I finally realized it wasn’t working because I was trying to teach her English. Instead, I should have been speaking Dog all along. When it comes to marketing your brand, there’s a lot you can learn from Fido. For 10 months, my dog Layla and I had some serious communication issues. I’d say “stay,” and she’d trot toward me for a treat. I’d say “jump,” and she’d hit the floor, legs splayed. If I wanted her to nibble playfully at my hand, you can bet she’d decide to walk next to my knee in a dignified manner. What does all of this have to do with marketing? First, it helps to understand how communication differences arise between any two beings–be they dog or human. Tell the dog what to do. Hit the dog (or yank on its leash, or yell at it) if it disobeyed. Praise the dog for doing it right. The dogs were terrified of us, and spent more energy avoiding beatings than trying to please us. The dogs had no idea what we wanted, because we had no way to lead them to correct behavior. The dogs often became adversarial and dangerous. As human beings advanced, we figured out that there was an easier, more effective way. We learned it from dolphin and falcon trainers, who couldn’t exactly punish their animals. They could train only with rewards. So now Operant Conditioners (whose most common method is clicker training) mold their animals’ behavior by rewarding them for desired behaviors, and withholding treats for other behaviors. So I treat Layla every time she sits. Pretty soon she walks right up to me and sits, hoping for a treat. At first, I said the word “sit” every time she sat, and gave her a treat. After a while, I only treated her for sitting when I said the word “sit.” Now I’ve accomplished the task: I’ve taught her the meaning of an English word, and that she should obey it. But the words I teach Layla to obey can only go so far. Here’s why: I’m spending hours a day trying to teach English to a dog. I don’t want to brag, but I believe that I’m more intelligent, linguistically, than Layla. I have a bigger brain. I have whole circuits devoted to symbolic language. I don’t spend my free time climbing into the dishwasher and licking the dishes. So why am I knocking myself out teaching her English, a language in which “slow up” and “slow down” have the same meaning? In which “commence” means both to start, and to finish? In which “cleave” means to cut apart and stick together? It’s because I didn’t realize I could learn her language. But The Other End of the Leash has taught me the basics. Here’s the first giant revelation: Humans are primates. We, and our cousins the chimps and gorillas communicate very differently from dogs and other canids (that’s a fancy word I learned–it means “dogs and wolves”). So we naturally “speak” primate to each other, and we understand primate very well. But when we speak primate to dogs, they think we’re nuts. For example, primates show dominance by making lots of noise. (Remember the chimp in the Jane Goodall documentary who discovered how to bang on oil drums and quickly became alpha male?) 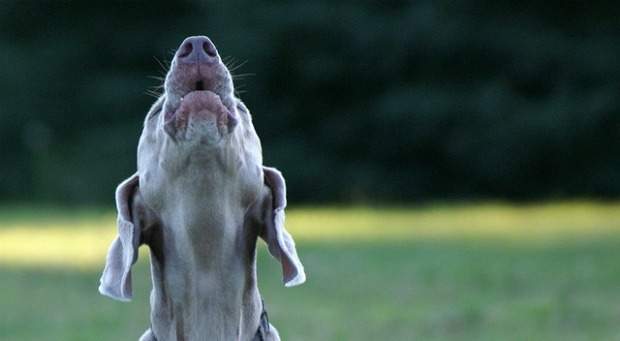 Dogs show dominance by their silence; it’s usually the nervous/frightened/miserable dog who’s doing all the barking and howling. Another example: Primates like face-to-face contact when greeting. Eye contact, kissing, shaking hands, hugging–these are all variations on how humans, gorillas, chimps, and bonobos greet one another. Dogs and wolves, on the other hand, greet and acknowledge each other in a more sideways fashion, sniffing butts. One last example: showing affection. Primates use their arms to show affection–holding hands, hugging, walking arm in arm, putting their arms on each others’ shoulders. Canids use their forepaws in much the same way, but with a very different message: dominance. Putting your arm around your dog signals to her that you have a higher ranking than her, and therefore priority access to important resources. So now when I want Layla to sit, or stay, or come, I use my body like a dog would. I lean, I use eye contact, I use noises and cadences. And here’s the absolutely mind-blowing thing: she obeys, without any training. She understands me, because I’m finally speaking her language. Properly trained, a man can be a dog’s best friend. It’s important to talk to people in their own language. If you do it well, they’ll say, “God, he said exactly what I was thinking.” And when they begin to respect you, they’ll follow you to the death. Tragedy is when I cut my finger. Comedy is when you fall in an open sewer and die. Are you marketing in You-lish or They-lish? When I start marketing a product, I naturally start by talking to myself. I write sales copy that appeals to my values. I argue the price/value question in ways that I find convincing. I use layouts and pictures that interest me. Unless my market is very much like me (which rarely happens, believe me), I’m going to fail. I’m not going to succeed in teaching my prospects Howie-lish. If I want to communicate with them, I have to learn their language. How do I go about learning their language? First, I do research. I read what they read. If they’re online, I visit their websites and newsgroups. I see how others are successfully marketing to them. I find out as much as I can about how much money they make, where they live, how old they are, how many kids in college, etc. You know, basic demographics and psychographics. I interview as many of them as I can. I find out what’s on their minds. I try to sell them the product and capture all their objections. Next, I go through some thought exercises. I imagine myself living their lives, having their problems, dreaming their dreams. The art of marketing, at its core, is empathy. Finally, I start writing like I would talk to them, knowing everything I know. I may not be perfect, but at least I’m no longer trying to speak Gorilla-ish to a dog. And when they sense that I’ve made the effort to bridge the gap and understand them, my prospects often take a step toward me as well. When market research is too costly or time-consuming or impractical, I fall back on quick and dirty split testing. Using Google AdWords, I make two offers, and count which one gets a better response. That’s my control. I keep that one, chuck the loser, and create a new one. Again, I keep the winner and replace the loser. What I’m really doing, of course, is allowing my market to train me, rather than me trying to train my market. And that’s why Layla no longer thinks I’m a moron. Now it’s time to convince my kids. Anybody know a good book on kid-dish?